These Kelloggs Pop Tarts Chocotastic are the perfect way to start the day for all you chocolate lovers out there! Delicious chocolate flavoured pastries filled with even more chocolate – what more could you ask for? A quick and easy snack – perfect for you late risers. Simply pop them in the toaster for a couple of minutes and you have a hot chocolaty snack in no time! 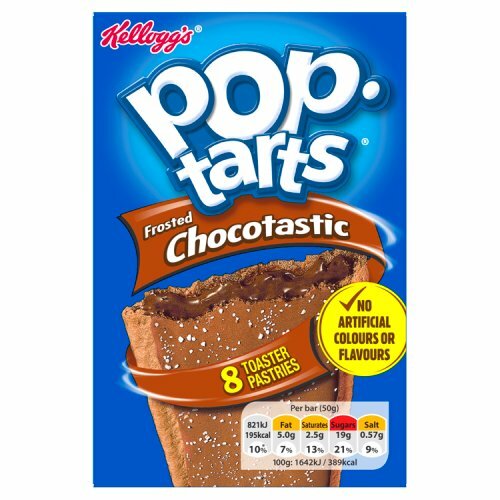 Most popular with customers in France, Italy, Germany, Greece, BFPO, Spain, Austria, Australia and Norway, but you can buy Kelloggs Pop Tarts Chocotastic for delivery worldwide. 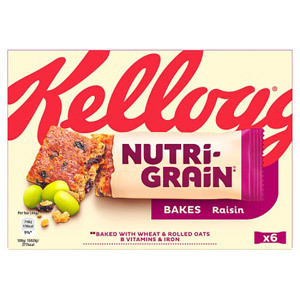 One of our Kelloggs branded products. 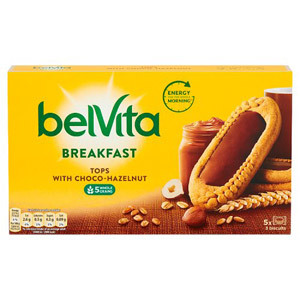 Contains Eggs, Contains Milk, Contains Soya, Contains Wheat. Wheat Flour, Sugar, Dextrose, Palm Oil, Glucose Syrup, Milk Whey Powder, Invert Sugar Syrup, Fat Reduced Cocoa Powder, Wheat Starch, Salt, Raising Agent (Sodium Hydrogen Carbonate, Diphosphates), Beef Gelatin, Dried Egg White, Modified Starch, Stabiliser (Xanthan Gum), Colour (Caramel E 150d, Titanium Oxide), Flavouring, Emulsifier (Soy Lecithin), Niacin, Reduced Iron, Vitamin B1 (Thiamin), Vitamin B2 (Riboflavin), Folic Acid. Personally, I'm not much of an ice cream fan. These however are a perfect substitute for a bowl of ice cream. My mum bought some of these a few weeks ago and they were gone within 2 days. I had half of one and she and my nieces devoured the rest. Pop tarts are a perfect breakfast food for the on the go and running late for the bus folks. 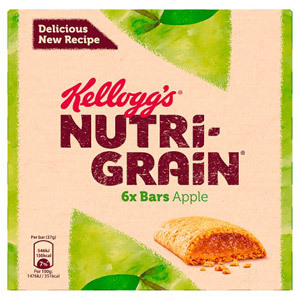 If you crave a chocolate 'fix' for breakfast this is the Kellogs pop tart is for you. With chocolate pastry and even more chocolate in the centre it certainly is a chocolate lovers dream. They are a very convenient breakfast option as you only have to heat up the pastry in your toaster. 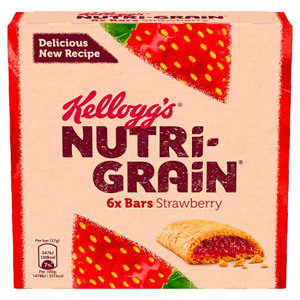 Kelloggs have made a good product here although I do not know how healthy they are for you. Who said Pop tarts were only for kids? I am nearly 30 and discovered them a few years ago in a night shop in Holland as they don't sell them in France. Even if my favourite is the cherry flavour, I tried the chocotastic ones the other night when I was craving chocolate and they were deliciously indulgent. Would you like to write a review for Kelloggs Pop Tarts Chocotastic?